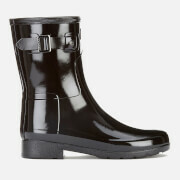 Womens Original black rubber short wellies with a tailored silhouette and a buckled strap side detail from British heritage footwear label Hunter. Handcrafted with waterproof rubber uppers, the boots feature a classic Hunter silhouette but with refined details including a reduced curve in the toe and the extension of the top front. Set on a thick textured rubber sole with a low block heel, the Original rubber ankle boots are complete with the signature moustache detail to the toebox and red and white Hunter branding. Upper/Sole: Rubber. Lining: Textile.